I dreamed up this recipe on my drive home from a really long 12-hr shift. 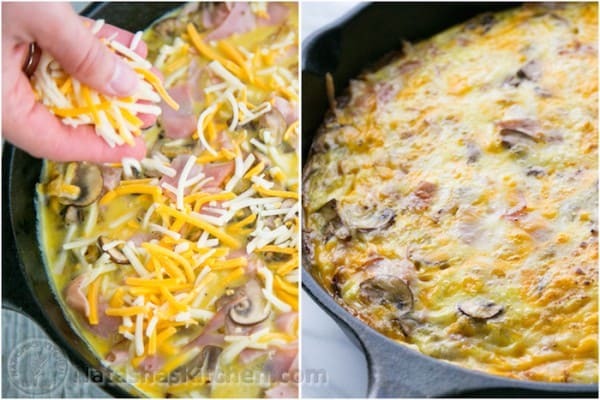 I set out to make this cheesy breakfast casserole the next day and it was a hit! My husband and son just loved it and had seconds. They both seemed to really like it with ketchup #oldschool. I love that this is a one pan meal. It goes from the stove straight into the oven. This means less dishes for me (which is one of my goals in life). 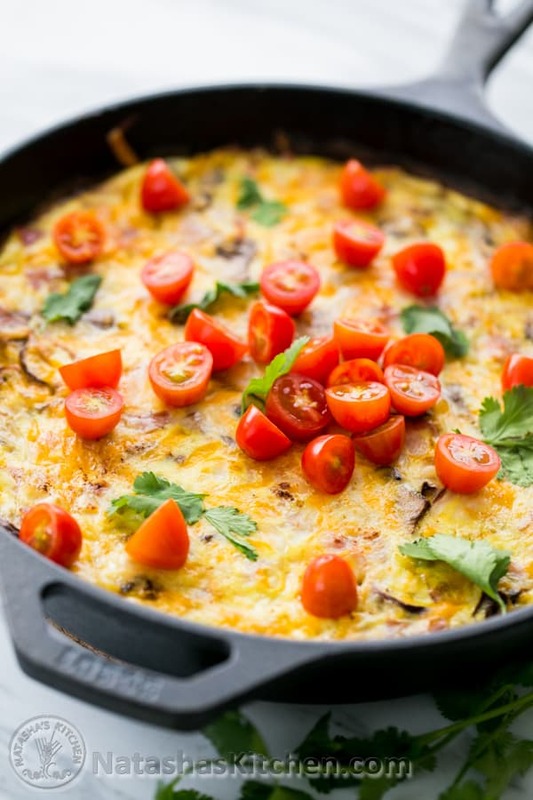 If you don’t have an oven safe pan, you can use a regular skillet and transfer your hash browns to a baking dish. P.S. 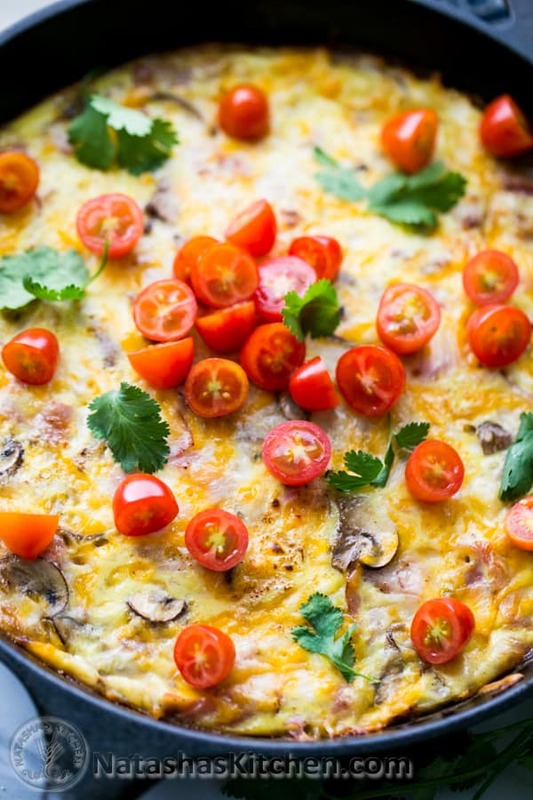 This breakfast casserole is a great choice if you have company over for breakfast. 4 oz (about 1/2 cup) ham, sliced into 1″ long strips. 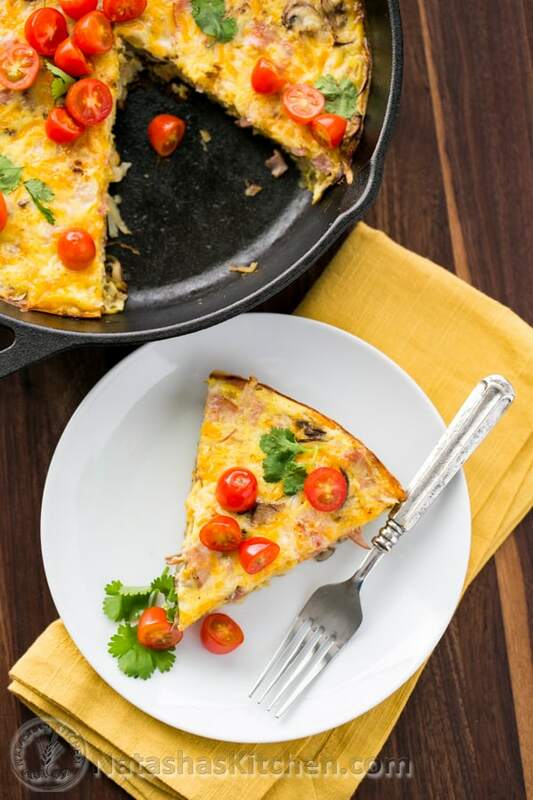 I used an 8″ cast iron skillet OR You can also use a regular pan for the hash browns and then bake in a deep pie pan or a casserole dish. 1. Heat your skillet over medium heat. Melt in 1 Tbsp butter then add chopped onion and saute until golden. Remove onion to a plate. 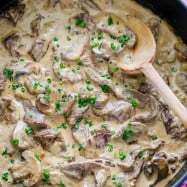 Add sliced mushrooms to the hot skillet and saute until golden and soft. Remove to the same plate as the onions. 2. In the same pan over medium heat, melt 1 Tbsp butter with 1 Tbsp olive oil. Layer the hash browns evenly into the bottom of the pan and sautee until golden on the bottom (about 7 minutes total). Flip hash browns over a few times while sauteeing. Once they are golden brown and nearly cooked through, remove from heat. Note: If you are baking in a casserole dish, transfer your potatoes to that dish and set aside. 3. In a large bowl, whisk together 6 large eggs, 1/4 cup sour cream, 1/2 tsp seasoning along with about 1/2 tsp salt and 1/8 tsp pepper. 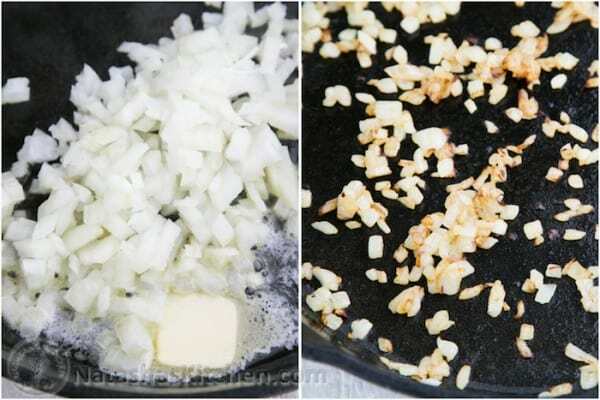 Whisk together until well combined then stir in sauteed onion and mushrooms. Stir in sliced ham and 1/2 cup cheese just until combined. 4. 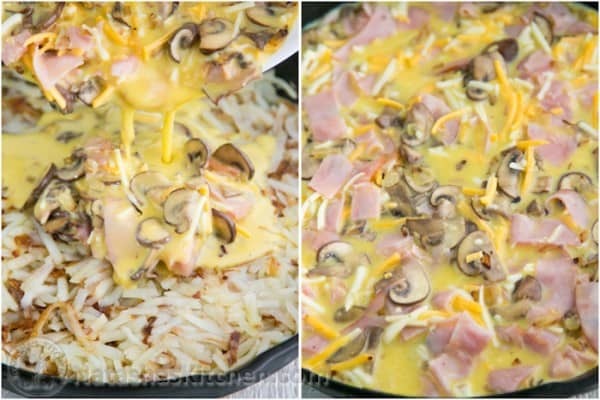 Pour the egg mixture evenly over the hashbrowns and top with remaining 1/2 cup shredded cheese. 5. Cover loosely with foil and Bake at 350˚F for 25 minutes then remove foil and Bake another 5-7 minutes or until cheese is bubbly and starting to brown. 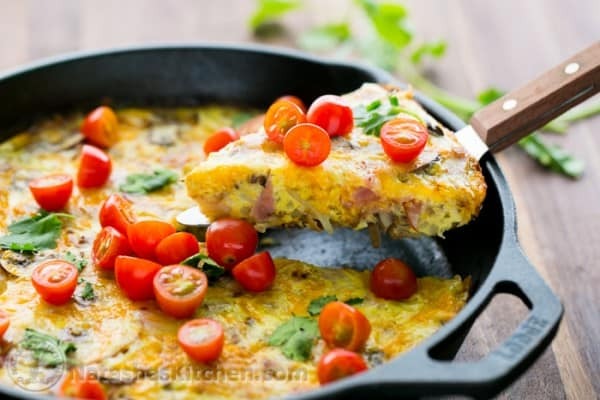 Garnish with halved baby tomatoes and fresh cilantro or sliced green onions. Enjoy it with sour cream, hot sauce, or ketchup (of course) ;). I love that this is a one pan meal. It goes from the stove straight into the oven. 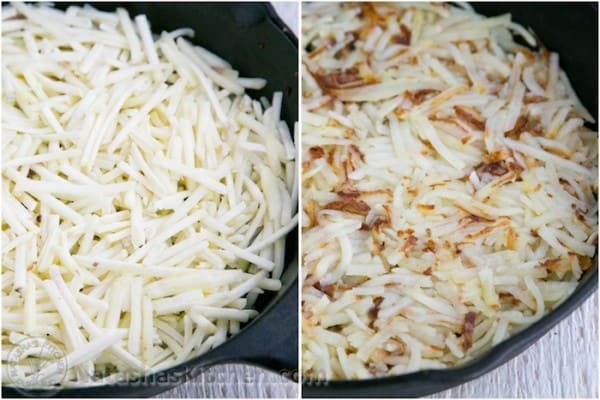 If you don't have an oven safe pan, you can use a regular skillet and transfer your hash browns to a baking dish. 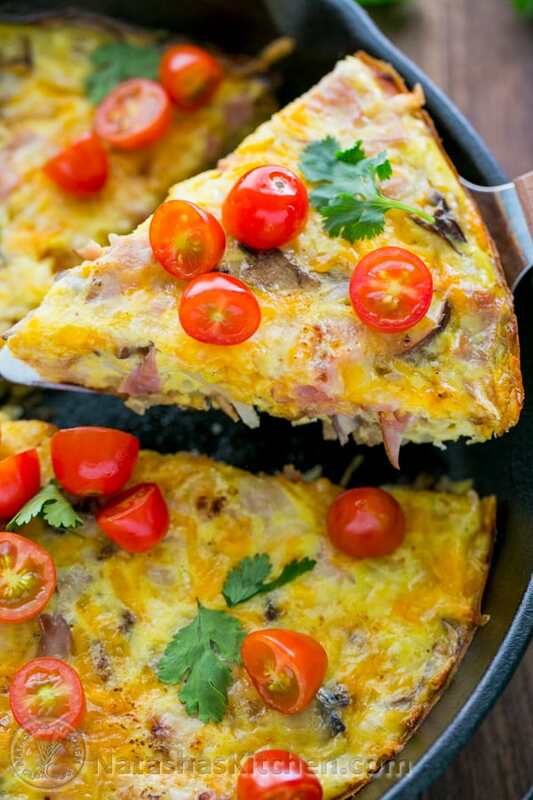 This breakfast casserole is a great choice if you have company over for breakfast. Enjoy it with sour cream, hot sauce, or ketchup (ofcourse) ;). 4 oz about 1/2 cup ham, sliced into 1" long strips. 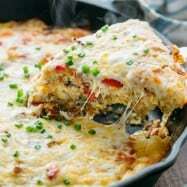 I used an 8" cast iron skillet OR You can also use a regular pan for the hash browns and then bake in a deep pie pan or a casserole dish. Pre-heat oven to 350F. Heat your skillet over medium heat. Melt in 1 Tbsp butter then add chopped onion and saute until golden. Remove onion to a plate. 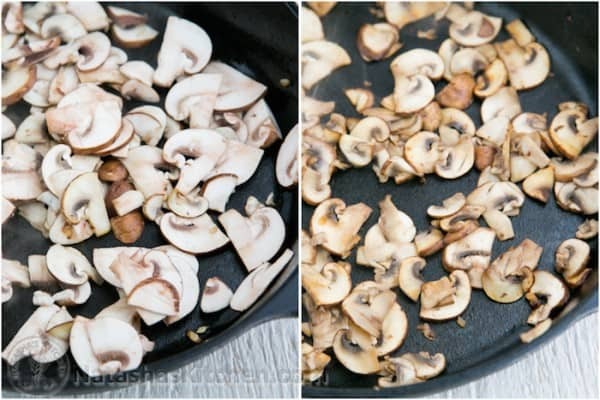 Add sliced mushrooms to the hot skillet and saute until golden and soft. Remove to the same plate as the onions. In the same pan over medium heat, melt 1 Tbsp butter with 1 Tbsp olive oil. Layer the hash browns evenly into the bottom of the pan and sauté until golden on the bottom (about 7 minutes total). Flip hash browns over a few times while sautéing. Once they are golden brown and nearly cooked through, remove from heat. Note: If you are baking in a casserole dish, transfer your potatoes to that dish and set aside. In a large bowl, whisk together 6 large eggs, 1/4 cup sour cream, 1/2 tsp seasoning along with about 1/2 tsp salt and 1/8 tsp pepper. Whisk together until well combined then stir in sautéed onion and mushrooms. 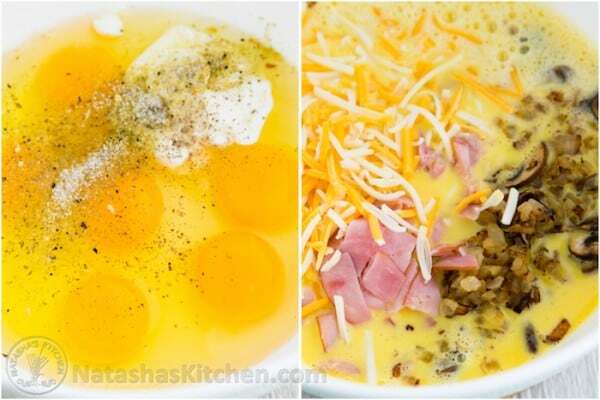 Stir in sliced ham and 1/2 cup cheese just until combined. 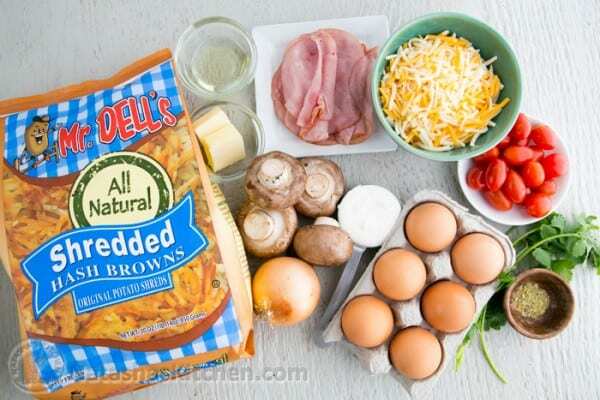 Pour the egg mixture evenly over the hashbrowns and top with remaining 1/2 cup shredded cheese. Cover loosely with foil and Bake at 350˚F for 25 minutes then remove foil and Bake another 5-7 minutes or until cheese is bubbly and starting to brown. Garnish with halved baby tomatoes and fresh cilantro or sliced green onions. Thank you for visiting my blog, trying the recipes and sharing them with those you love. I hope you and your families enjoy this recipe. If you make it (and especially if you change it up and add something unique), do let me know! I would love to try this for my next weekend’s brunch birthday family get together. 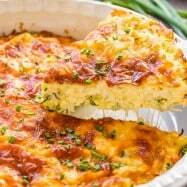 would i be able to use a glass baking dish? 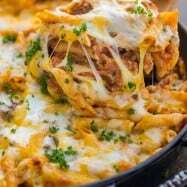 instead of casserole dish? Thank you!!! i will try this. can i prepare this the night before and put it overnight in the fridge? 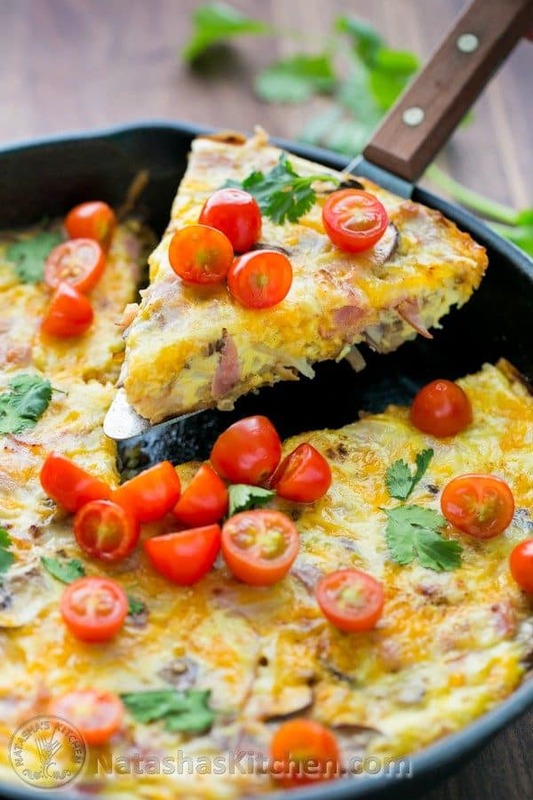 or it is better to prepare this dish in the morning ? 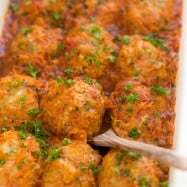 I made this using ground lamb instead of ham and it was delicious. I have requests to make it again. It is great to make for the week to have breakfast ready without rushing to cook every morning. Oh Yeah! This recipe is perfect. 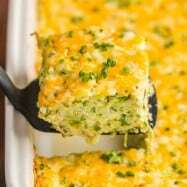 I made this breakfast casserole AND the zucchini fritters from Natasha’s pages for a gathering of eight last Sunday morning. I made the casserole in a cast iron skillet, which creates the perfect crust, and I completed the masterpiece in under an hour. It is much easier to do than it appears at first glance. For the fritters, it is important to take the time to squeeze out excess water. For another side, I fixed this cucumber salad that I learned in Egypt. . . a very nice compliment to the fritters.